Growing up, health and nutrition were not of much significance to my family. However, as I’ve gotten older, I’ve learned to prioritize my own health as a means of being a better example for my 3 children. I started my fitness journey with running and still enjoy running. However, I was looking for other ways to challenge myself and had tried numerous other activities to stay fit but would grow bored of them after a short while. A friend told me about CrossFit San Leandro and I was a bit reluctant because the heavy lifting intimidated me. It took one basics class for me to realize that this was my next challenge. It didn’t take long before I fell in love with the sport and the community. That was almost 3 years ago. 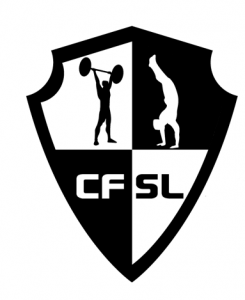 CFSL is my safe place. It is my second home and where I feel my strongest. Needless to say that when the opportunity for me to become a coach came along, I jumped at it! I love helping people and wanted to pass on the knowledge and skills that my coaches have taught me and continue to teach me. I am currently a full time Medical Assistant and I am also currently pursing my BSN in Nursing. I hope to inspire others by proving that it is never too late to get healthy and fit while also following your dreams!